Another Earth Day has come and gone, and at Around the World Beauty, we want to make sure that we keep the spirit of eco-friendly sustainability going. We like to think of Earth Day as a lifestyle reset, when we examine our habits and make what changes we can to help out the environment. Change starts small, and that’s why we’re joining Love Beauty and Planet’s #SmallActsofLove challenge (read until the end to find out how you can enter their amazing contest* on Instagram). You’ve probably seen Love Beauty and Planet’s gorgeous floral bottles popping up everywhere, and they are inspiring everyone to make environmentally friendly changes to their routines. Little changes add up to big results, especially for our planet. So, in the spirit of #SmallActsofLove, we’ve compiled a list of six fabulous beauty products from brands that champion Earth-friendly practices, and each product is matched with a tip on how to reduce your carbon footprint while using them. It’s a win-win for your beauty routine and planet Earth! 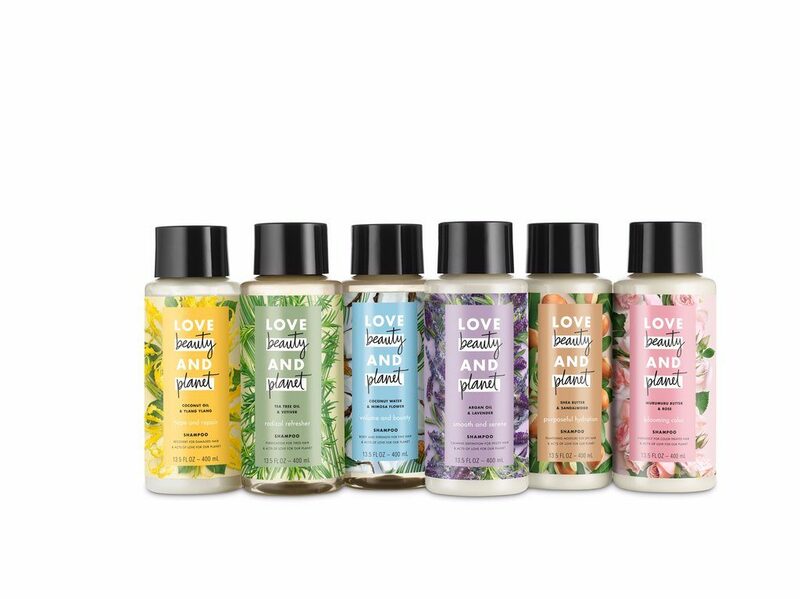 Love Beauty and Planet has burst onto the beauty scene with its gorgeous, Instagrammable packaging and mission of total sustainability. 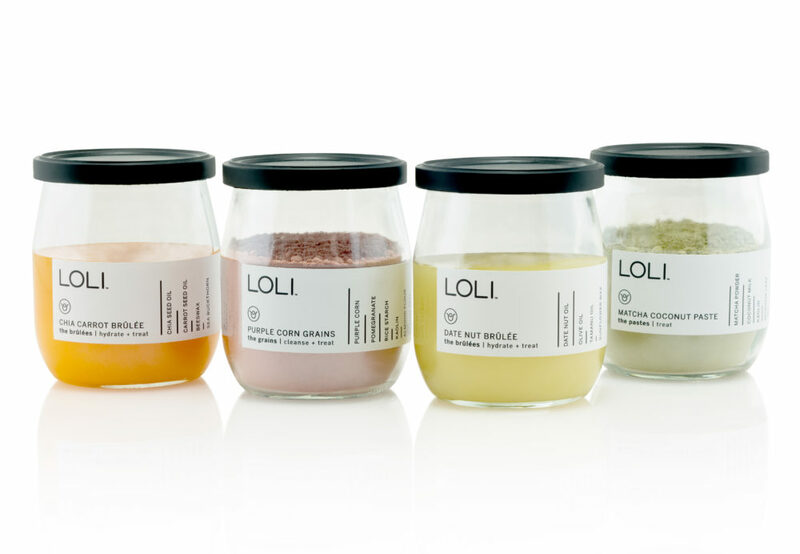 Their bottles are made with 100% recycled materials, their fragrances are ethically sourced, and even their conditioners are formulated to be washed out quickly, using less water. They’re so serious about eco-consciousness that they will tax themselves if they go over their CO2 emission goals. How’s that for commitment? And if you’re committed to shiny locks, be sure to pick up their Hope and Repair Coconut Oil and Ylang Ylang Conditioner: it smells great, looks adorable in your shower caddy, and will rehab parched hair in a flash. –Small Act of Love: When washing out your Hope and Repair Conditioner, turn the tap to cold. It is great for locking moisture and shine into your hair cuticle, and cutting back on hot water usage conserves energy. It takes a little getting used to, but once you see how crazy glossy it makes your hair, you’ll never go back! When looking for green beauty companies, a grocery store may not be your first thought for a booming beauty department. However, at Whole Foods you can find dozens of eco-friendly brands alongside your vegan mac n’cheese. One of the star products you can pick up at Whole Foods is Weleda’s Skinfood, a cult product that has withstood the tumultuous skincare trends of the past several years. It’s a thick, heavenly smelling cream that will put an end to the driest of cuticles and elbows, and is a savior on flights to protect your face from the recycled air. Plus, you can rest easy knowing Weleda has championed sustainability since the beginning, and in 2013 they reduced their water usage by 25% percent. –Small Act of Love: When you head to Whole Foods to pick up your tube of Skinfood (and probably some gluten-free Paleo brownies too, let’s face it! ), bring a reusable cloth tote bag from home to carry your purchases in. Reusable bags are one of the easiest ways to reduce your carbon footprint wherever you shop. Always keep a couple in your car so you don’t forget! Next up is Pacifica, which is making some cool strides in the industry with its recycling program. Their Preserve® campaign is helping us take all of our product empties and putting them to good use for the environment – and it’s super easy. On their website, you simply fill out the product you’ll be recycling (make sure you rinse it out! ), and they’ll send you a pre-paid shipping label to your email. When you’re done with the product, simply print out the label and send it back. Easy, right? If you’re on the hunt for your next Pacifica product, we recommend the Alight Multi-Mineral BB Cream — its moisturizing properties and blurring pigments will give you that Earth Goddess glow. –Small Act of Love: After you’ve responsibly recycled your amazing BB Cream through Pacifica’s program, take a look at your own routine. Are you really recycling as much as you can reasonably manage? Toss those cheap paper plates in favor of regular plates that can be reused, or buy a thermos to bring to your favorite coffee shop for refills instead of getting one of the use-it-and-lose-it paper cups. –Small Act of Love: If the plumping Plum Elixir has you craving some fresh fruit, commit to purchasing more of your produce from local markets. Not only will you be shopping seasonally, but you’ll be supporting the environment and economy of your local community. Look for local farmers markets that have set standards for their vendors in terms of environmental practices. The Body Shop is like the cool mom of the skincare industry: she’s been around forever but she’s still got it, she helped us tackle our first ravages of acne, and she taught us how to think about a greater environmental good years before other brands hopped on board. It would take a lecture series to cover all their environmental practices, but one of their coolest initiatives is their Bio-Bridges Mission. With every product purchased, they restore one square metre of a rainforest, helping save countless species of plant and wildlife. To protect your square metre of rainforest, buy a tube of their Tea Tree Squeaky Exfoliating Face Scrub, which will have your blackheads banished in record time! –Small Act of Love: While you’re scrubbing your pesky skin cells away, turn off the tap. Simply turning off water when you don’t need it massively reduces your consumption in the long run. The same goes for when you’re doing dishes – if you don’t need water to rinse, turn it off! Any list of eco-friendly brands would be incomplete without Origins, which has championed many of the environmentally responsible practices brands follow today. They are working towards a zero carbon emission by 2020, and everything from their packaging, to their ingredients, and their manufacturing is designed with the Earth in mind. So, when you pick up their famous Drink Up Ten Minute Moisture Mask,you know you’re supporting some great environmental advances. You’ll also be flooding your skin with essential moisture, great for before (or after) a night out. –Small Act of Love: While putting your feet up and letting your hydrating Drink Up mask go to work, turn off any lights and electronics you absolutely don’t need on. By getting in the habit of turning off non-essential lights and appliances, not only will you save money on your electric bill, but you’ll be helping the planet, too. If you want your #SmallActsofLove to have a big impact, be sure to join Love Beauty and Planet’s contest* on Instagram (running through the end of May)! You can win $10,000 for the planet-loving charity of your choice simply by sharing your #SmallActsofLove photos. Be sure to use the official hashtags #SmallActsofLove and #LBPcontest, and tag @LoveBeautyandPlanet to enter. 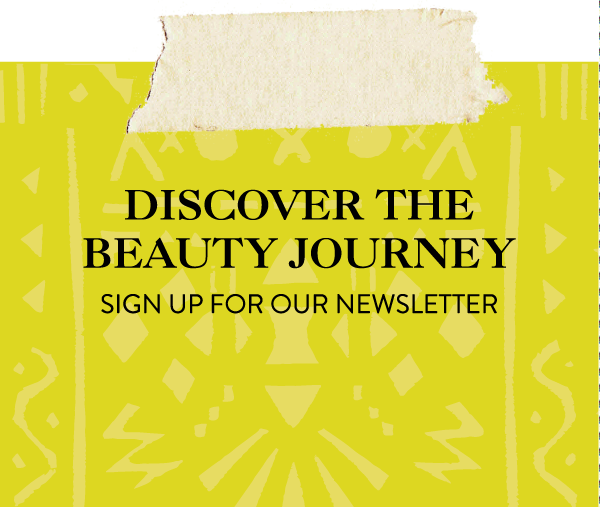 At Around the World Beauty, the Earth is not just a place to explore on our beauty journeys, but it’s our Mother Gaia. We care deeply about the environment and this amazing sphere we all call home. We hope you’re inspired to create some #SmallActsofLove while going about your hectic lives — stay green and gorgeous, gals! Jars are food grade and meant to be reused, their labels are compostable, and for every $75 spent, they donate $1 to responsible sustainability organizations. While you’re scrubbing your pesky skin cells away, turn off the tap. * Contest Rules: NO PURCHASE NECESSARY. Void where prohibited. “Love Beauty and Planet’s Small Acts of Love” Contest is sponsored by Conopco, Inc., d/b/a Unilever. Open to legal residents of the 50 U.S. & D.C., 18 & older, who possess a web enabled mobile device as of 4/21/18. Begins 12:00 a.m. ET on 4/22/18 & ends 11:59 p.m. ET on 5/20/18. For official rules, visit smallactsoflove.dja.com.